What is being described as "the final step to protect the unique waters around Easter Island" became official Feb. 27 when a decree to establish a Marine Protected Area (MPA) was signed by Chilean President Michelle Bachelet. 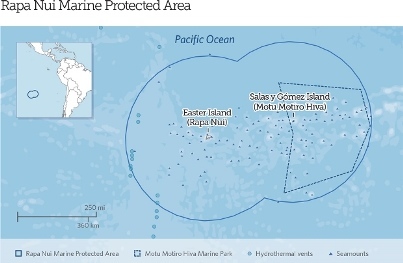 The new Rapa Nui MPA covers 720,000 square kilometers, an area of ocean about the size of France, and guards against industrial fishing and extractive activities while protecting the traditional fishing practices of the Rapa Nui. It was achieved through the work and leadership of Rapa Nui groups, including a coalition of business leaders, fishers, and more than 20 local organizations, along with support from the Bertarelli Foundation and the Pew Charitable Trusts. The Bertarelli Foundation was created in 1998 in memory of Fabio Bertarelli, father of Ernesto and Dona Bertarelli. Dona Bertarelli, co-chair of the foundation, said, "This is an incredible moment in the history of Easter Island. The Bertarelli Foundation is very proud to have accompanied the Rapa Nui for the past six years as they campaigned to protect their waters and their heritage." The foundation works to deliver real change in the fields of marine conservation and science, life science research, and in local communities around the world by developing partnerships with scientists, NGOs, governments, and local stakeholders. The waters around Easter Island are home to at least 142 endemic species, including 27 that are threatened or endangered. The Rapa Nui MPA contributes a huge stretch of ocean to the global push for 30 percent of the ocean in protection by 2030, the target recommended by scientists and the International Union for Conservation of Nature, according to the foundation, which cautions there is still a very long way to go. "Chile has shown its leadership to conserve the global ocean, and looking forward, there is a lot more work to be done by countries everywhere if we are to protect 30 percent of the ocean by 2030," Dona Bertarelli said.